Research indicates that purse seiners caught 80%-90% of the vulnerable migrating salmon present in Johnstone Strait during what were commonly 48- or 72-hour fishing openings. Some might recall Al Meadows's comments (Cockpit Comments. Western Fisheries 102 (August 1981): 28): "I'll be reviewing a study known as the Ledbetter Report in a future comment. This report is about the seine boat fishery in Johnstone Strait and I have heard disturbing news that the Fisheries Service is attempting to water down and suppress it." In the December 1981 issue of Western Fisheries, Mr. Meadows continued, "Max Ledbetter, writing in the guest editorial section of the October issue, is, I feel, pulling some punches and not telling the full story. He is, however, absolutely correct in his summation, where he suggests that fishermen had better develop communication amongst themselves and their various gear types. Recent history has shown us, and the fact that wild chinook and coho are on the verge of extinction further reinforces the realization that we cannot depend on the D.F.O. to do the job" (Cockpit Comments. Western Fisheries 103 (December 1981): 11). In British Columbia, Canada, salmon purse seiners line up at fishing access points, forming well defined queues (line-ups). These queues were measured from a Cessna airplane, over time, using a one-dimensional recording scale. Sixty-one overflights of Johnstone Strait and Queen Charlotte Strait were attempted; 51 flights were completed. Ledbetter, Max. 1986. Competition and information among British Columbia salmon purse seiners. Ph.D. diss., University of British Columbia, Vancouver, B.C. Firstly, your thesis is in our collection under ISBN 0-315-34900-X. To Borrow: It's available from the National Library via Interlibrary Loan. There's no charge for this loan and the format is microfiche only. For anyone contacting you to borrow your thesis, give the person your thesis particulars (including the above ISBN) and have him get in touch with his local library to make the loan arrangements (Interlibrary Loan is indeed just that: a loan between two libraries. Individual clients can't request loans). With this info., our Interlibrary Loan office will retrieve the microfiche copy of your thesis and send it to the originating library (as a reference, you may want to look at our Web site http://www.nlc-bnc.ca and refer to Interlibrary Loans). To Buy: It's available on microfiche only from UMI, our filming and sales contractor. Again the format is only microfiche. There are three (3) price ranges for your thesis. An academic client would be charged $36.00U.S. ; a non-academic client would be charged $48.00U.S., and an international client would be charged $50.00U.S. Royalties are paid to qualifying authors, i.e. theses of authors which have sold more than seven (7) copies in a given calendar year. A 10% royalty of theses sales is awarded to an author. In a nutshell, UMI is part of the Canadian theses picture as many Canadian universities and the National Library of Canada were interested in the services they offer, primarily the high profile of their international databases and the diversity of their coverage (an array of Canadian, American and European theses and dissertations make up UMI's current collection). It was (and is) in the best interests of the Canadian academic community and our Library to bring UMI on board. Thus, an agreement was reached in 1997 to include UMI in the Canadian theses profile. If I may help further, please let me know. I'm surfing around tonight and I've seen your posts in a few forums. In short your info re: BC Commercial Salmon Fishing is old news and posted in the wrong forums-those FF Guys don't give a s*** either way. Also the info you present is old. The situation here in BC is that David Anderson-when he was Federal Fisheries Minister- got Sportfishermen priority on the Chinook and Coho stocks with Commercials receiving the majority of Pink, Chum and Sockeye-all of us after Conservation & native AFS Fisheries of course. The seine fishery in Johnstone Straight may look ugly-Hell it is ugly-but it's supported by the best scientific advice-tempered of course by political considerations-that the FOC can find. Your feeble attempt to tie Pacific and Atlantic Salmon Fisheries together somehow-and after reading your site I'm still not sure how- shows how little you know about the Pacific Salmon situation. One day you may indeed be "doctor of philosophy of something" but for the moment you need to inform yourself better/present your findings in the proper forum. I'm retired from fisheries (thank God) and living in Ontario--last time I was in B.C. was 1987. Furthermore, yours is just one opinion regarding old but, it seems to me, still relevant research: fishing power. In fact, the resource management papers published in the Canadian Journal of Fisheries and Aquatic Sciences have not progressed much since 1986. Same old stuff. I guess some of the jargon is new. . . .
And how does a seine separate the coho from the pinks in Johnstone Strait (etc.)? Thanks for insulting my Ph.D. status before reading the dissertation: It's in the UBC library. . . . If you have been surfing, you must know that numerous small-boat owners worldwide are virtually up in arms at large fishing boats (i.e., quite concerned about fishing power) and have called for a global strike on World Fisheries Day, 21 Nov. (see the WORLD FORUM OF FISHER PEOPLES: http://www.wffp.org/?file1=globalstrikeposter.htm). Re:-"last time I was in B.C. was 1987"
My point exactly-you are completely out of touch. "And how does a seine separate the coho from the pinks in Johnstone Strait" Seiners are now are (sic) all required to carry tanks which are used to revive any Coho taken. Coho are brailed-do you know what that means?-out of the seine and placed in the revival tanks-with excellent results. If your info were in any way current you'd know this. As to "me/mine" I'm a Sportfisherman of 40+ years experience here in BC, Ontario, coastal Oregon, Mexico, Costa Rica, Ecuador and Fiji-I've spent more time in a small boat fishing than many people have at work. Because of my extensive first-hand experience I've seen the battles artesenal fisherman fight against factory-fishing operations. The situation here in Canada is in no way analogous to that in other climes-not even close. Good Luck with your studies-I can only hope that upon your graduation that you don't end up in the employ of FOC-they have enough bumblers advising them as it is. My research on purse seines is still relevant: fishing power is still fishing power. Like they said on P.E.I., a fleet of purse seiners can wipe out a stock (anywhere in the world). I doubt that you could understand my dissertation, and I have no intention of re-entering the realms of B.C. fisheries. Mine is simply an attempt to promote my past research. Time will tell. . . .
Looks like a serious wrap, not too many places for a fish to high tail it to for survival. That's about as tight a wrap as I've ever seen. There's got to be some limits, has to be . . . Thanks for sharing. The dissertation must have been interesting, heck of a lot more interesting than what I did in school, finance . . . I think I see the connection you are making of the two cases [salmon seiners in B.C. and herring seiners in the Gulf of St. Lawrence]. However, are you aware that the Gulf [herring seiners] have access to 23% of the overall quota, they can't fish for roe (no access to spawning grounds), they don't catch immature fish, they have dockside monitoring and at sea observers, etc. . .
On the other hand, the inshore fishermen use gillnets on spawning grounds and have access to 77% of the quota. Knowing the limitation imposed to the seiners, is the fishing power of the seiners still a threat to stock conservation in your view? Thanks for your input. I am not, of course, an Atlantic expert. However, I often fail to see how general quotas protect individual stocks. I have seen seiners TARGET river mouths, inlets, rip tides, individual salmon stocks, ocean perch, chinook, squid, etc., and I have observed firsthand the damage the nets inflict on both mature and juvenile fish. From my field experience, which I doubt is now completely "old hat" (given what I read in the Canadian Journal of Fisheries and Aquatic Sciences), I know the general capabilities of the "pirates" within the fishing fleets. Thanks for your email and site. . . . I work with salmon and bears, especially the significant processes of nutrient transfer to forests which may account for their productivity. I am concerned about the over-mechanization of ocean harvest. What if we harvested mushrooms with bulldozers? I'm for terminal fisheries of salmon using sailboats. I have flown over Port Hardy [during a commercial fishing opening]. Looks like a Marines invasion. Many thanks for providing us with the address of your website. We have read the information presented on the site and found it most useful. The problem with European fleets is also one of over capacity. Many of our fish stocks are below biologically safe limits. The problem of bycatch is a severe one - non target fish species, cetaceans, turtles, seals and sea birds. Decommissioning of vessels does not reduce capacity, as the fishing quotas are sold to other fishermen who own more powerful vessels. At this time of year there are many purse seiners fishing for mackerel, pilchards etc. in the Western Approaches. In the same area are large pair trawlers, other pelagic trawlers, beam trawlers and driftnetters. It is a nightmare. European politicians seem incapable of taking steps to deal with the fishing industry, effectively. The subsidies provided to the industry encourage over capacity. We are involved in a campaign which is lobbying to have cetacean bycatch mitigation measures incorporated into the European Common Fisheries Policy. We are lobbying politicians and fishermen's organisations, and are asking our supporters to do likewise; lobbying supermarkets to provide consumers with information regarding the method of capture of their fish products, and to purchase fish caught using handlines and pole and lines; contacting as many artisanal fishermen as possible (those using handlines, and pole and line only), and asking them to provide as much sustainably caught fish as possible, therefore providing the consumer with the ability to buy fish which has been caught in a sustainable way; we then promote the fish caught using the methods mentioned. Next year, we are planning a "Fish Free Week" throughout Europe, to demonstrate to politicians, the fishermen's organisations, and supermarkets that the public is not prepared to see the fishing industry destroy our seas, and the creatures living in, and dependent on, them. I hope to contact the World Forum of Fisher People, as perhaps we might be able to help each other. I hope we can keep in contact. Any further info will always be appreciated. The following was posted on www.sportfishingbc.com - 01/12/2001 : 10:35:25. Thanks for the data. 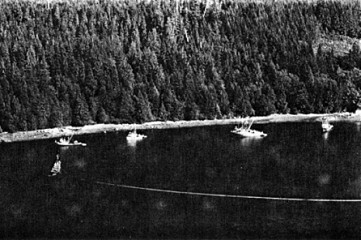 As a saltwater guide in 1957/58, it was common knowledge that sportfishing [in British Columbia] was finished for the week after a commercial opening. Things haven't changed. With the private boat licence buy backs it put the Fisheries into the hands of a few owners who will instruct the fleet to fish in the most efficient manner. Only the stragglers in a school of salmon manage to escape the nets. The big schools all get scooped up. I feel like I am somewhere in between El Nino, Parvicapsula minibicornis, a farm fish and a purse seiner. The following was posted on www.iboats.com - 22/03/2002. Max, I can feel only a tiny bit better about what's happening in Washington (state) and Oregon. Our fish agencies keep very close tabs on the commercial fishery in, say, the Columbia River and Puget Sound, but for obvious reasons, usually don't have a real clue about what's happening before they get here. There are two conditions that have improved: 1) we are making good progress in hatching habitat, but, of course, much more needs to be done; 2) the "war" that goes on between Canadian and US fishers seems to be abating. On a very positive note, we're experiencing for the 2nd consecutive year a large spring and fall run in the Columbia. We trust El Nino will stay away.